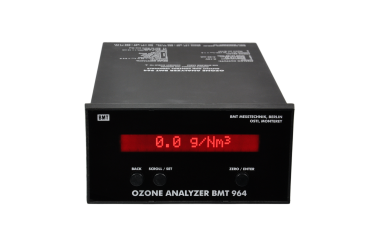 The OZONE ANALYZER BMT 964 TRANS is a very precise transfer standard for high ozone concentrations. It is sort of a “Winchester ’73” instrument, made with the highest diligence and accurateness. And it comes carefully calibrated at BMT against the BMT PRIMARY OZONE STANDARD, the most precise ozone primary standard available. The BMT 964 TRANS should be used only for testing “normal” ozone analysers, but not be used as a utility instrument.